This is an all time French classic and is the perfect ending to a meal regardless of the season. 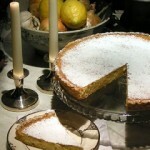 You can make this tart in a traditional tart pan that is 27cm. (11 inches) or use a 22cm. (9 inches) quiche pan which will produce a thicker version. You will need this Pate Brisée for the tarts base. This is an all time French classic and is the perfect ending to a meal regardless of the season. 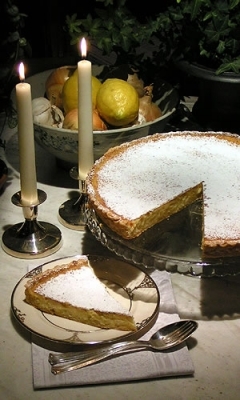 This recipe will produce a thick creamy filling that is very lemony and tart. You can make this tart in a traditional tart pan that is 27cm. (11 inches) or use a 22cm. (9 inches) quiche pan which will produce a thicker version. 4-5 lemons grated rind of 4 lemons. 65 grams powedered sugar for decorating the tart. Preheat oven to 180° C. or 375° F. Get he recipe for Pate Brisée from the link above. Make the recipe for Pate Brisée and let it rest in the fridge for one hour. Then roll it out and line your pan. Do not trim off the overhanging dough. Dock the dough with a fork and place in the fridge to rest again for an hour. Preheat oven to 180° C. or 375° F.
Leaving the extra pie crust on the tart is a trick that bakers use to get as much filling into a pie case as possible. After the tart is cooked you then use a knife to trim off the excess cooked pie dough. When cooled remove the beans and paper and paint the inside of the tart shell with the single beaten egg to coat it well.and bake again in a 160°C or 300°F degree oven for 5 minutes until the egg has cooked. This will water proof the tart shell. Reduce the heat in the oven to 160°C or 300°F. Grate the 4 lemons and squeeze them. Once you have squeezed the juice from them strain it and add it to the grated rind. In a bowl large enough to hold all the wet ingredients break the eggs, add the plain sugar and beat lightly to dissolve the sugar. You don’t really want to beat any air into the mixture you just want to dissolve the sugar. When done add the lemon rind and strained juice and mix in well then add the cream and mix again. Pour half the liquid into the waiting tart shell and place it on a baking tray in the middle of the preheated oven. Pour in the rest of the egg mixture into a water pitcher. Pull the oven rack half way out and pour in as much of the filling as you can. Using a pitcher like this means that you don’t have to balance a tart shell full of cream across your kitchen dripping all over the floor. If you are using the 22cm. quiche pan you should have a little filling left over - don't throw it a way. Grease a small oven proof dish just large enough to hold the extra liquid and bake for about 20 minutes after the tart comes out of the oven. It will be a little extra treat. Very gently slide the oven rack and tart into the oven. Using the traditional tart pan of 27cm. (11in.) bake at 160°C or 300°F for about 60 minutes or just until the filling sets. Using the 22cm. (8-1/2in) quiche tin bake at 160°C or 300°F for about 1hr. 30minutes, or just until the filling sets. Remove from the oven and let cool. Take a paring knife (very sharp knife) trim off the extra short pastry using an outward cutting motion trimming all the extra pastry taking care not to touch the top of the lemon filling. Take the remaining powdered sugar and place it in a fine strainer and sprinkle it over the top of the lemon tart to decorate it. I love this recipe, it is one of the better ones I have gotten. It is a lot easier than it would seem here. I have just written as much as I could to make it as good for you as it is for me. You should make this in advance as it needs about 4 hours to sit before eating it. It should be served at room temperature with a little whipped cream. You can refrigerate the leftovers and it will keep for a few days. The short pastry should hold up for at least 24 hours in the fridge as the shell was fully baked before the filling was added. It is traditional to use the 27cm tart pan and have a thin lemon tart but in the age of Americanization where bigger seems better, there are plenty of people who would prefer this tart made thicker, more like an American pie. Perhaps it would be better to just make a lemon meringue pie which is fantastic and a hell of a lot easier.